When looking for the best selection for your favorite set of wheels, you might not think to check Sea-Doo Parts Nation, but don't let the name fool you. When you shop Sea-Doo street and cruiser accessories with us, you are getting the best on the market for this particular vehicle type. We cater to a range of models and years to ensure you get the best solution for your favorite set of wheels when shopping with us. Our inventory of Sea-Doo street and cruiser accessories covers a wide range of options from Honda to Yamaha to ensure you get the right accessory for your needs. Aside from the wide range of models and years, you will also find a diverse selection of accessory types in our inventory. From battery and body needs to tires and trailers, we have it all in one convenient place for easy shopping. Whether looking for a scooter grip, single shocks, saddlebags, or seats, we have you covered with the diverse selection in our Sea-Doo street and cruiser accessories collection. Regardless of which model or area you are shopping for, rest assured that every option is made with high standards of manufacturing excellence from durable materials for an option that is both high performing and built to last for the best of both worlds. 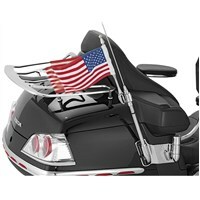 Whether looking for solutions for the lighting system, a universal bungee net, or a flag for your motorcycle, you are sure to find exactly what you need when shopping with us. From essentials to function such as windshields to elements of fun like body parts in the right color for your personal preference, find it all right here! Add some extra customization or a few essentials to your favorite set of wheels today. We are committed to outstanding customer service from start to finish with every order. If you have any questions while shopping with us, please reach out for further assistance on the matter at hand.